The Net of Stars: What's Correctable in this Image? Do they have pleasantly fuzzy edges? Are they free of color fringing due to optics or processing? Do they have color that's pleasing in both hue and saturation? Is it a neutral gray? Is it as smooth as might be expected from the data? Is it free from any substantial gradients? Does it fade smoothly into the background? Is it the right color (both hue and saturation)? Has the data been processed correctly to reveal fainter portions? Is the image free from dust shadows and other unwanted diffraction effects? Have "rogue" pixels been cleaned up? Have the effects of vignetting been corrected? Here's my latest image, and let's see how it measures up. Focus is decent but the stars are not round, probably indicating a tracking issue. The stars are reasonably fuzzy and show some color--not a lot, but enough for my taste. Background color and intensity is good. 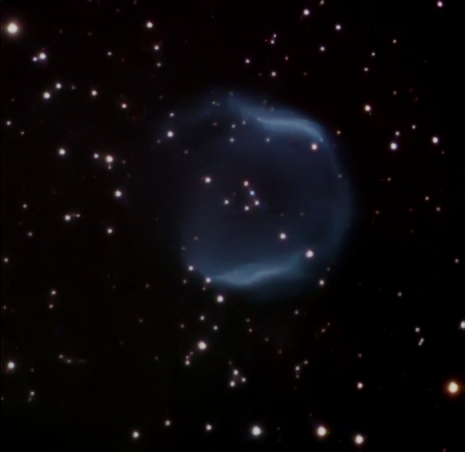 The histogram isn't clipped, and the nebulosity fades smoothly into the background. So far as I can tell by looking at other images the object's color is fairly captured, as is the amount of structure given the imaging system. Software was used to reduce the effects of light pollution and vignetting. There weren't many bad pixels to clean up in this cropped image thanks to fresh dark and bias frames. The full field was not at all flat in a way that suggests that the sensor to flattener distance was significantly off. Add that all up and I conclude this is an acceptable image but nothing special. A big improvement would be to improve the tracking. Adjusting the sensor spacing would reduce the need for cropping. And collecting more data would help--it almost always does. Regarding the tracking, I'm beginning to wonder if the Orion MiniGuider is adequate for guiding a 1480mm imaging scope. Some experimentation is in order along with trying different spacers to correct the flatness issue.